Edited by Karen Marta and Gabriela Rangel, José Leonilson: Empty Man is a fully illustrated publication released to accompany the solo exhibition of José Leonilson at the Americas Society (September 27, 2017–February 3, 2018). José Leonilson came of age as an artist during the 80s generation in Brazil. What he shared with this diverse artistic milieu was the so-called "joy of painting," rediscovered in the years following the end of Brazil's dictatorship. What separated him from his contemporaries was his personal way of working and his distinct aesthetic centered on raw emotional feelings, introspective musings, and private affairs. 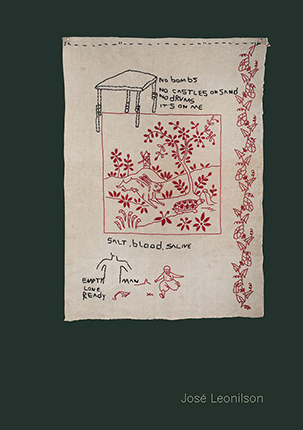 Focusing on Leonilson's production as a mature artist, the catalogue will feature approximately fifty paintings, drawings, and intimate embroideries made between the mid-1980s until 1993, when the artist died of AIDS. This short yet prolific period showcases the artist's fully developed language, connecting Leonilson's oeuvre with contemporary art practices, Brazilian vernacular traditions, and global issues prompted by the AIDS crisis. Learn more about the exhibition José Leonilson: Empty Man in Americas Society and watch a video.